With the benefits of ginger, perhaps something different in your stuffing - Especially if you like a sweet bread. The sweet bread called for here was introduced to Hawaii by nineteenth-century Portuguese immigrants. The stuffing can also be cooked inside the turkey, provided the bird is roasted immediately after being stuffed. Preheat oven to 350°F. Place bread cubes on baking sheet. Bake until dry and firm, stirring occasionally, about 18 minutes. Transfer to very large bowl. Butter 13x9x2-inch baking dish. 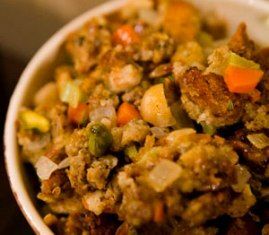 Mix enough chicken broth into stuffing to moisten. Season with salt and pepper. Mix in eggs. Transfer stuffing to prepared dish. Cover with foil. Bake 45 minutes. Uncover and bake until golden brown on top, about 10 minutes longer.